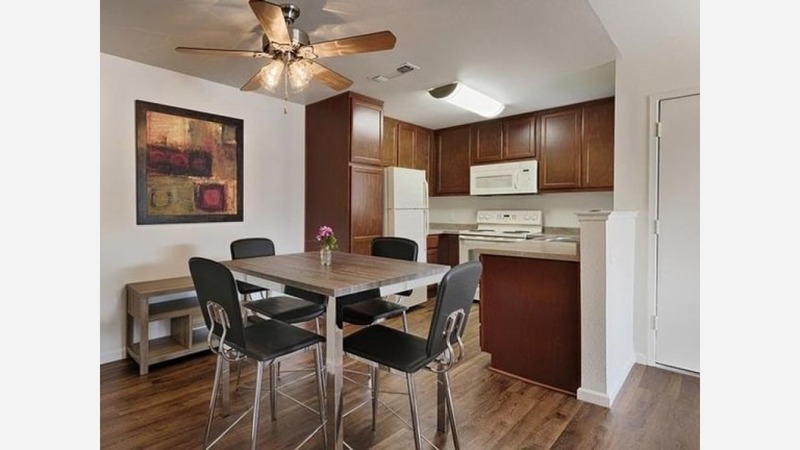 What will $1,100 rent you in Fresno, right now? We've rounded up the latest rental listings via rental site Zumper to get a sense of what to expect when it comes to locating an apartment in Fresno if you've got $1,100/month earmarked for your rent. Listed at $1,047/month, this 642-square-foot one-bedroom, one-bathroom apartment is located at 5250 N. Brawley Ave. The building has outdoor space, a swimming pool, a fitness center and on-site management. In the unit, you can anticipate a mix of hardwood floors and carpeting, a ceiling fan, wooden cabinetry and in-unit laundry. Cats and dogs are welcome. Per Walk Score ratings, this location is somewhat walkable, is relatively bikeable and has some transit options. Next, there's this one-bedroom, one-bathroom located at 8680 N. Cedar Ave. It's listed for $1,025/month for its 620-square-feet of space. The apartment features carpeted floors, air conditioning, a dishwasher, in-unit laundry and a balcony. Business amenities include two swimming pools, outdoor space and a fitness center. According to Walk Score, the surrounding area is somewhat walkable, is fairly bikeable and has some transit options. Here's an 806-square-foot one-bedroom, one-bathroom at 3910 W. Beechwood Ave. that's going for $1,020/month. The building offers on-site laundry, a swimming pool, outdoor space and a fitness center. In the unit, you'll get carpeted floors, a walk-in closet, a fireplace, a dishwasher, wooden cabinetry and a breakfast bar. Pet owners will be happy to hear that cats and dogs are welcome here. According to Walk Score, the surrounding area requires a car for most errands, isn't particularly bikeable and offers limited transit options.